Anyone beginning the adventure of crossing the Pyrenees from the Cantabrian Sea who decides to spend the night in Hondarribia or Irún, might consider the possibility of walking the prologue stage on the day of their arrival. 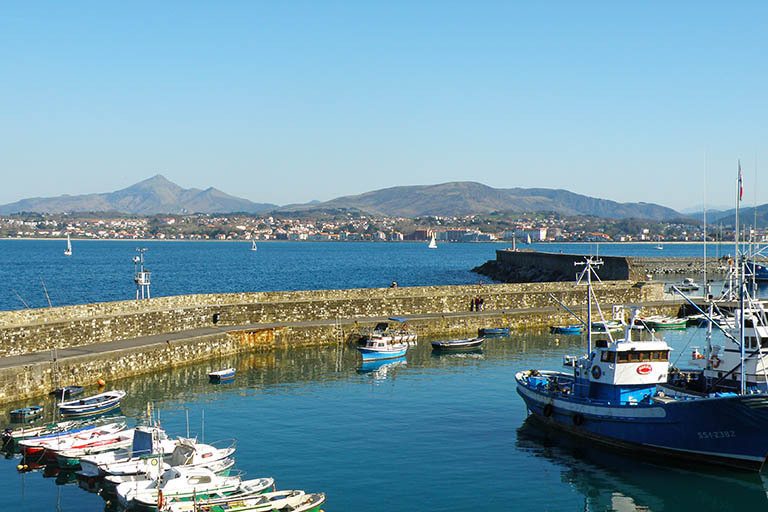 A leisurely walk to Cabo de Higuer, bathing on Hondartza beach, discovering the fishermen’s quarter in Hondarribia or a few glasses of beer in the old town in Irún, are all well worth a visit. Once you have reached Hondartza beach in Hondarribia (see below the section "transport" for how to get to Hondarribia) you follow paseo Ramón Iribarren in a westerly direction, past the port docks and continue along the road which climbs up to the lighthouse, leaving the Castle of San Telmo on the right. Just after the castle, before reaching a horseshoe bend, leave the road to follow a path waymarked as GR-121. In just a few minutes you reach Higuer Lighthouse, the spot you may consider to be the starting point of your route. The alternative option is to take a taxi up to Cabo de Higuer from the railway or bus station in Irún (7kms; 1h45min walking). This (urban) prologue stage is unmarked, and marking only begins at the other end of Irún. From that point onwards, waymarking is excellent. Puerta de Santa María (4,5 kms). To carry on towards Irún, you turn right after crossing the bridge and follow calle Minasoreta as far as a large roundabout next to an Eroski supermarket. Exit the roundabout to the south, road GI-3440, leaving it immediately to continue along calle Santa Engracia, which you follow as far as road N-638, next to the airport. You continue walking in a southerly direction until just after passing a bridge over a river (Amuteko canal), where you leave it to continue to your left/straight on along the GI-2134 road which takes you into Irún. plaza de San Juan (8,2 kms), where Irún Town Hall stands. Turn left down calle de San Marcial and then follow calle Pellegrin de Uranzu as far as Estebenea stream. Just after crossing the stream, turn right and follow it for about 100 metres until you see a roundabout with a palm tree to the left. Head towards it and go straight ahead down calle Alzukaitz, cross another roundabout and follow in the same direction until you reach a small stream – don’t cross it. Just before it, on the right, is the beginning of a path and cycle lane where you will find the first markings of the GR11 trail. End of urban section (9,2 kms). In Irún we recommend Pensión Gema	(//) (affordable and close to the railway station and GR11) and	Hotel ETH Irún (//) (very comfortable, an eco-building, with a restaurant. It is situated close to the border, next to the AP-8 motorway). You can get to Hondarribia by city bus from Irún (lines E22 and E25) and San Sebastián (E20 and E23). From San Sebastián the E20 takes us quite close to cabo de Higuer, but the best option is to take lines E24 or E26 and change at the Colón 42-43 stop (Irún), then take the E25 towards Lurgorri. Renfe, Renfe cercanías, euskotren o SNCF (from France). By plane, there are regular flights from Madrid and Barcelona to Hondarribia airport, and from Biarritz (28kms) you have a wide choice of international flights.